Currently a Junior at Loyola University Chicago studying History and Latin, I’ll be spending my next year abroad in Rome and Beijing. 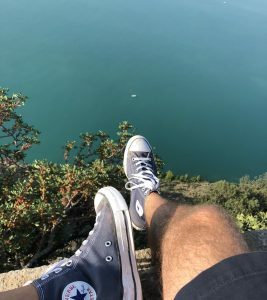 I’m from a small suburb outside of Cleveland, OH, but I’ve always wanted to travel, dive into new cultures, and meet people from different backgrounds. That’s why I chose the Ricci Scholars Program which allows me to travel and do research for this year on workers’ rights in both countries. I’m excited to immerse myself both in the amazing tourist opportunities and in the life of everyday citizens. I can’t wait to share these adventures with y’all! For this weekend, I did not know enough French to say even the title. In fact, to write the title, I had to ask my friend to type out “I do not speak any French” in French (on that note, any complaints about translation can be directed to Laney Miller). Yet – while I may not have known a lick of French – I felt so much at home in Paris. I spent this trip with two of my close friends: Morgan and Amanda. Inspired mostly by Beyonce’s hit song “Love on Top,” but also by a desire to visit one of the most magnificent cities in Europe, we set out to enjoy a weekend of adventures and crepes together in Paris. 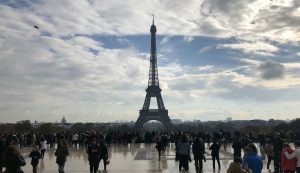 Upon arrival, we all went straight to the most busy site in the city – the Eiffel Tower – so we could get our bearings and enjoy a crisp morning in the park. 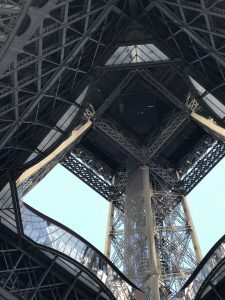 I always knew the Eiffel Tower was massive and imposingly beautiful, but I did not expect to be so stunned when we emerged from the Trocaderó stop of the Paris metro and saw the impressive building. We waited a little while underneath the structure and then made our ascent and peered out in wonder over our new home for the next three days. It seemed like Paris never ended, and we knew there was no way to explore all of its secrets but we decided to try our hardest. 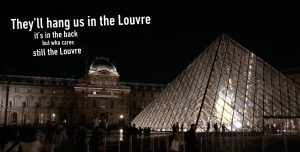 That evening, knowing that the Louvre offers free entry to young European residents (for which, thanks to our staying in Rome, we qualified), we went to my new favorite museum. The Mona Lisa and Winged Victory were impressive, yes, but what struck me the most was how the Louvre was like an exhibit itself. The museum’s halls had been designed by countless different geniuses throughout the ages and thus even its ceilings and walls began to merge with the art it hosted. With the sound of Lorde in my head, I was mesmerized by what I saw. Afterwards, we sat down for some sweet crepes in the Latin quarter and walked past Notre Dame on our way home. Totally casual. Saturday morning, we made our way outside of the city to Versailles. Or, at least, we tried to. Turns out the three of us were not as good at navigating as we thought. 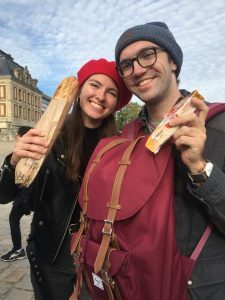 Nevertheless, despite hours of confusion and chaos, we ended up at Versailles and ate our baguette and brie while waiting in line to the humor of all those around us. The Hall of Mirrors, Louis XIV’s bedroom, and the Gardens at Versailles were tremendous and gorgeous, but in truth its grandeur did not at all compare to the laughter we shared tucked away in the gardens over a bottle of Merlot. After Versailles, we returned to Paris and journeyed to a Digital Art gallery that I had heard about – L’Atelier des Lumières. While normally hosting an exhibit on Klimt, L’Atelier was instead showing an exhibit on nature and society on Earth called Terra Magnifica. In truth, it ended up being much more stirring than Klimt’s artwork would have been. 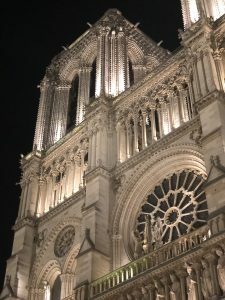 We discussed our thoughts as well as our favorite moments of the trip so far that night over escargot and other French cuisine. 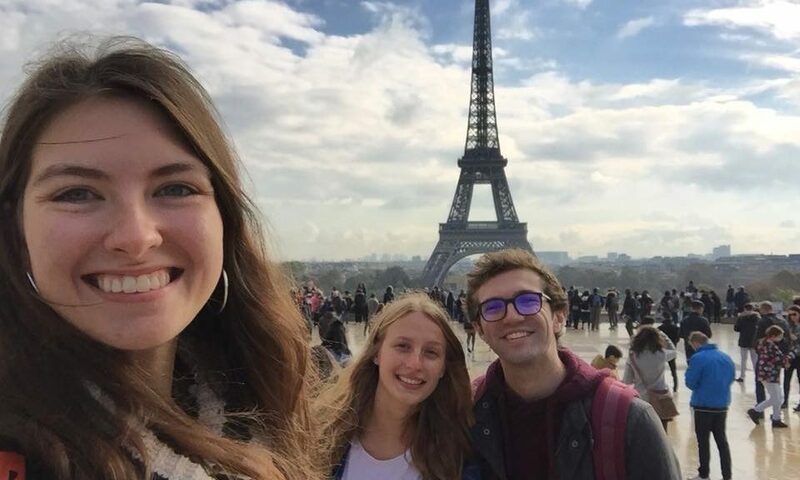 I had realized finally that, after years of making fun of the French language, Paris was one of the most comfortable and yet exciting places I had ever visited. I simultaneously felt at home and constantly driven to explore more of the city. We had purposefully planned very little for Sunday and soon found ourselves wandering through the streets of Paris in search of its gems. We eventually found a few truly hidden ones (like Breakfast in America – look it up!) as well as some better known ones (Shakespeare in Company, Les Catacombes). 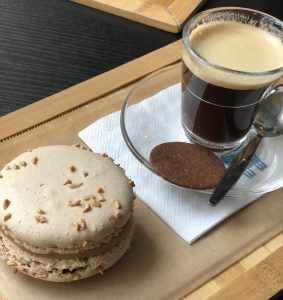 All of Sunday’s adventuring was fun and relaxing (at least, our pit-stop in Luxembourg Gardens was), but my favorite moment was when we were sitting in a small – A. Lacroix – with Amanda and Morgan and listening to the ringing bells of Notre Dame over macaroons and coffee. Paris felt like mine in that moment; it felt like Paris had decided to share those aforementioned secrets with me. 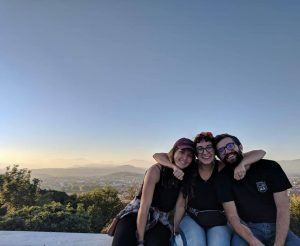 It feels Sisyphean to try and describe 10 days worth of adventures into a single post, but I’ll try my best to share the breadth of the experience I had travelling through Greece during my fall break by describing each of the towns we visited in quick vignettes. Hopefully they carry even half of the beauty and fun shared with friends there. 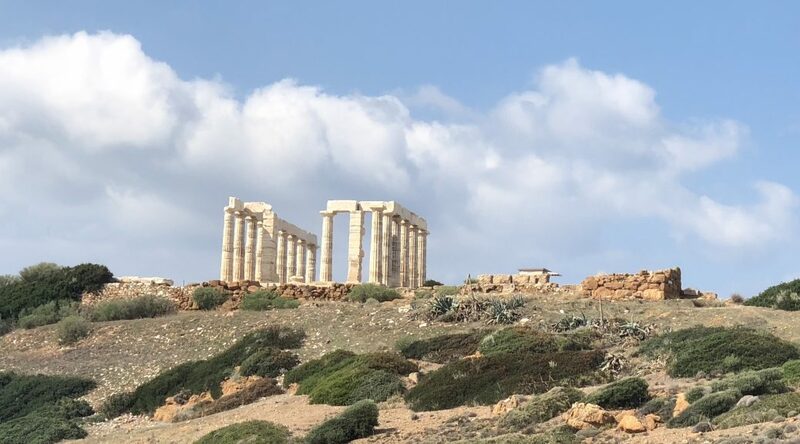 Sounio: We had left the JFRC at roughly 3 am with glassy eyes and little sleep (for me, in fact, no sleep at all), and our first official stop after flying from Rome and driving in the early Greek morning is the Temple of Poseidon. Sitting atop shining rock overlooking the sea, the Temple of Poseidon is not only the place where Aegeus (father of Theseus who killed the Minotaur) jumped into the Aegean Sea thus giving its namesake but also where Lord Byron inscribed his name before lending his hand in the fight for Greek independence. 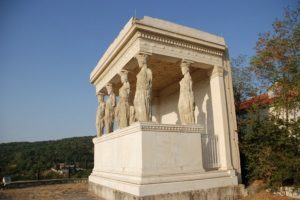 Greece is a country with an inspiring ancient history, but that history has inspired countless figures throughout history creating interesting ripples. These reflections and other excitements are shared among friends over plates of calamari at a restaurant nearby. Athens: While looking at photos taken the night before of rooftop gardens and bars with brightly colored bottles, my friends and I enjoy a light breakfast of yogurt and honey on our hotel’s own rooftop in view of the Parthenon (to which we would be heading that day). 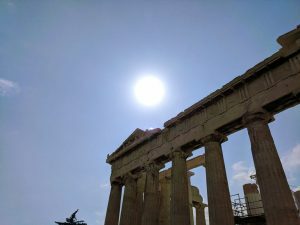 The sun is already high in the sky since we start no day of the trip any earlier than 10am, and we are ready to journey across town to the Acropolis Museum and then up to the acropolis itself. From far away, however, you could see why the Parthenon was one of the most impressive buildings in history. Even in ruins, it stands as a proud reminder of the genius of mankind. 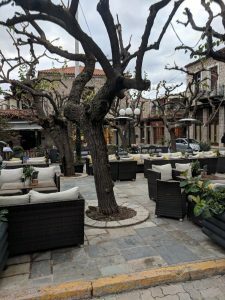 Arachova: In a small Winter Wonderland that reminded me less of how I imagined Greece and more of Colorado, a group of us travelers huddle for warmth around a fire outside of a cafe serving hot chocolate with Bailey’s and mulled wine. It feels as though time stopped or had at least removed us from it so we could have meaningful conversation. To be honest, I don’t remember what we talked about that night but I do remember laughing and enjoying the company of new friends. Overall, it feels familiar and like fall which both makes me comfortable and miss home a little bit. Nafplio: On our last morning in Nafplio (after a night out resulting in Laney and I eating the most delicious Loukoumades), we hiked up the 999 steps to the Fortress of Palamadi. I eventually lost count, but I think it was less than 999 steps. Three of us – underestimating the length while overestimating our strength – try running up it. At the top my legs are jello, but the view of Nafplio with the sun barely over the horizon and smoke coming out of some chimneys make me want to climb up even higher, all the way to the top of the fortress. We look out to the Aegean and see some people rowing; a friend mentions that a woman once gave her advice that rowing together keeps a marriage happy. On the way down, we talk about making art and I forget about the stiffness in my legs. Karyes: Although this was technically in the middle of our time in Nafplio, it needs its own section. A small group of us have separated from the large group of 45 students and are sitting in a wine cellar in the village. I’m drinking some good red wine, eating raw chestnuts and bread with honey, and listening to the leader of our trip Ioanna talk about her adventures. Just a bit earlier at lunch, our resident JFRC faculty member – Sander – gave a speech talking about how Greece feels like home. Ioanna asks us to all raise our glasses and vow to return home to her village sometime in the future. We clink our glasses, say “yamas,” and promise to come back home. 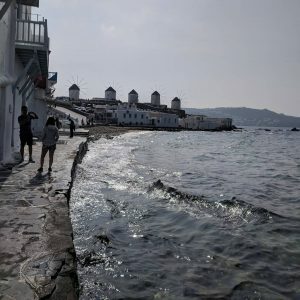 Mykonos: After getting lost in the alleyways during the morning, munching on some more calamari, stepping into the Aegean Sea one last time, and a marvelous group dinner, my friends and I are singing and laughing to “Dancing Queen” and “Oh Cecilia” at one of Mykonos’ clubs. We don’t want to leave Greece yet, but we can hardly focus on that while dancing. One of our friends is writing σε αγαπώ (“I love you”) on everyone’s hands. I eventually take a step outside for some fresh air and, from where I’m sitting, I can see both the water hitting the rocks of the beaches and my friends still dancing inside. I’m not sure if in the moment I’m more grateful for the view or for the friends I’ve made, but regardless I’m simply happy. The Half of an Odyssey: A long week has gone by, but we still have one final journey to make before we’re back home. On a bus to the airport, Ioanna reads “Ithaka” by C.P. Cavafy and the lines “Keep Ithaka always in your mind / Arriving there is what you are destined for / But do not hurry the journey at all / Better if it lasts for years…” resonate deep in me. So how poetic it seems when our flight to Rome is rerouted to Bologna and my dinner is made by buying cheap salami, prosciutto, and parmigiano reggiano from an airport market and split with my friends. In this moment, I am sure that I will always remember this meal and I wish that this moment on the trip could last forever. 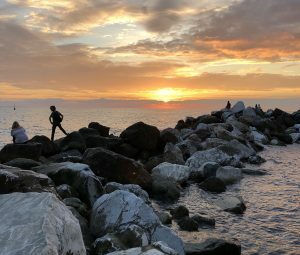 Despite its amazing potential to be the name of a low-budget Kung Fu movie, turns out Cinque Terre is just 5 gorgeous towns along the coast of the clear, blue Tyrrhenian sea with delicious and copious amounts of seafood. Total. Bummer. Nevertheless, Cinque Terre this past weekend was utterly stunning. In an unofficial poll I took of my friends who went with me, we all gave it a thumbs-up which is as official a promotion seven college students can give a place. The weather was perfect with a ton of sun when we went out on the boat and enough clouds on the other days to give the appearance of a stormy day at sea without it actually being a stormy day at sea. 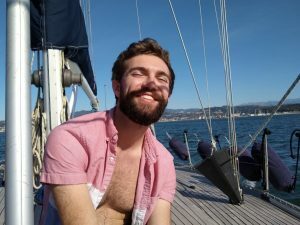 In true sea fashion, our Air BNB was a boat in the La Spezia harbor where we watched sunrises over coffee, waved to many tourists going on boat tours, and watched a man in yellow pants non-stop dance in front of his boat. In short, it was all I could ask for. To elaborate, we spent the first day out on our boat going around the coast of Cinque Terre and the second day wandering through the five lands. 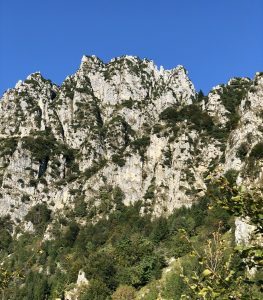 During our boat ride, our captain Piedro told us about the history of the place while taking us to hidden waterfalls and offering us fresh pesto pizza and rice cakes. Mixed with a little bit of cheap prosecco and I felt like I was living the high life. I even was lucky enough to get a ton of salt in my beard from swimming. Each one of us on the trip agreed that we had not done something so relaxing in a long time. The next day was my personal favorite and most anticipated: a journey through Cinque Terre. 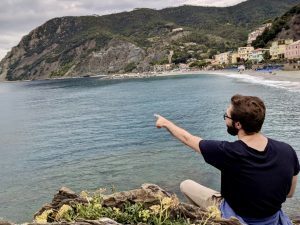 We started by heading out to the furthest town, Monterosso, where we climbed rocks and faraglioni, chowed on some streetza (my term for “street pizza”), and walked along the beach. From there, we continued to Vernazza where we had some gelato, found a cave of rock towers, and met some French people who very kindly let us pet their dog. 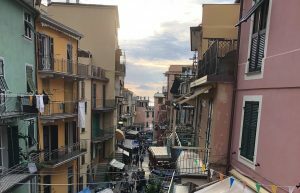 We then found ourselves in the high and hidden town of Corniglia whose tall alleys and views hidden under leaves gave us an entirely different experience. Next, we arrived at Manarola in the late afternoon as the sky was beginning to turn golden and the buildings colors began to shine. Finally, we ended in Riomaggiore to watch the sunset on the rocks and eat some delicious seafood. 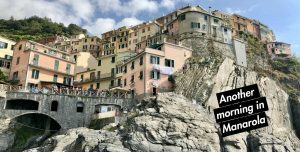 The real highlight of the trip, however, was when we returned to Manarola the next day to swim and relax before returning to Rome. The morning began warm and sunny, but by the time we reached Manarola, the sky had turned gray and a slight drizzle was falling. We were not about to let a little bit of rain ruin our plans, however. To the surprise of a fair number of other tourists, we jumped off the rocks into the cold water as the rain fell from above. Shortly thereafter, the clouds began to part and the midday sun shone again on the colorful buildings of Manarola. Although our swim was unfortunately interrupted by a few rude jellyfish who decided to sting one of my friends, the day made up for it with some fried calamari and tons of laughter on the rocky port of Manarola. When I woke up this morning after the trip, I began to realize how surreal all of it now seems. It was literally yesterday, but Cinque Terre was so beautiful and so relaxing that it feels worlds away from the return to schoolwork. And yet, I can’t get the way the sun hit the buildings at sunset or the jokes made with my friends or the way the lemony calamari tasted on my salt-covered lips. I wish I could return to the oasis, but I had some great moments to remember years from now and that’s pretty much the same thing. 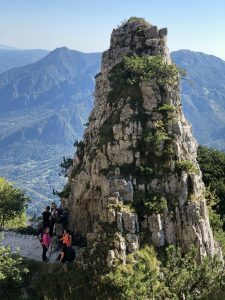 This weekend I went with a group of other students from the JFRC to Vincenza for a hike up the Strada Delle 52 Gallerie – a path carved into the Alps during World War 1 by Italian soldiers to serve as the front against the Austrians. The entire trip was so much fun and it felt great to get outside of Rome and see more of Italy. Our trip started early (maybe a bit too early) on Friday morning where we took a train from Termini to Verona. Once we arrived in Verona, however, the early morning turned into a perfect afternoon. The weather was beautiful, and Verona was an adorable little city to explore. My friends and I went around to some little shops, got some gelato, and eventually stumbled onto the ~supposed~ balcony of Juliet. At the balcony, people leave locks and letters to their loved ones. The balcony was fine, but I loved the doors covered in notes (below) and the alley covered in graffiti (above). After Verona, we made our way further north to the city of Vicenza where we would be staying in between our hike up the Alps. Vicenza itself is full of buildings designed by Andrea Palladio. Palladio’s work is exemplary of Renaissance architecture, with tons of classical references and proportions. 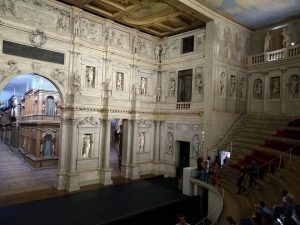 Merely walking through the city, one stumbles into countless pieces of his work including the Teatro Olympico. (To show how high up we were, I took a photo of the restaurant where we ate lunch once we returned to the base of the mountains. 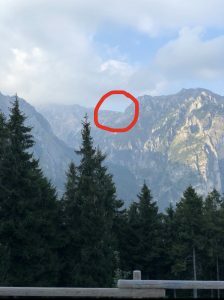 If you look in the center of the red circle, you’ll see a big yellow building that has become a tiny yellow dot — that was the restaurant on the return down from the Strada). 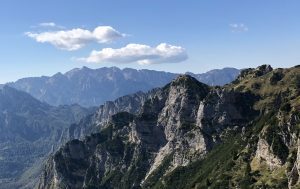 The hike was beautiful, the Alps were amazing, and my time with friends made it all that much better. I’m still a little sore, but I could not be more amazed and elated by the mountains we climbed. 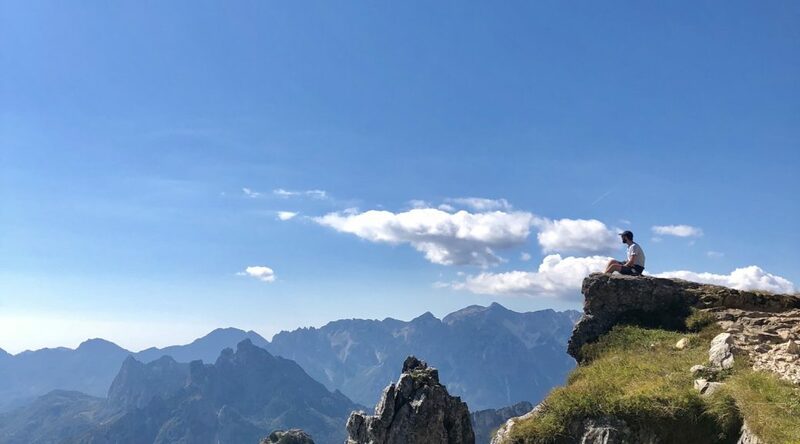 The adventurer in me could not have been happier, but now – back in Rome – I’m all the more excited for the next one! These past two weeks in Rome, I really feel like I’ve begun to take my own advice to heart and have found a way to start making Rome my city. The little map that I downloaded at the start of the semester is already filling up with a ton of gelato places, bars, museums, parks, and other spots around Rome that I’ve visited and want to remember. One of my favorites so far has been Villa Borghese; the giant grassy park reminds me both of the Metroparks back home in Cleveland and Millenium Park back home in Chicago. I can easily take some work there, just relax, and find myself lost in a new city. These past weeks have also started to get really immersing. I started my internship at the American Academy in Rome where I’m working with the Fototeca Unione project building up a Digital Humanities database for researchers and fellows at the American Academy. The work is interesting, and I enjoy finding out more about Roman monuments and sites in Rome, but the best part has actually been the walk back from the Academy. After long days of practicing Italian and working alongside other researchers, I walk down Via Garibaldi on the Janiculum Hill (usually to the sound of Jon Bellion) and take in the marvelous overlook of Rome. Each look – especially as the sun sets – is as miraculous as the one before it. I just want to explore all of Rome’s maze. And yet, despite how strong that feeling is when I walk down the Janiculum, I almost spent this weekend in. I had a rather exhausting week full of trips across town for my internship, trips across town for on-site classes, trips across town for my research… There were a lot of trips across town, okay? My legs did not want to walk another step. Luckily, I’ve made some great friends who refuse ever to let me rest. On Friday, I found myself in Trastevere experiencing some more of Rome’s nightlife: going for apertivo at Freni e Frizioni, having a chocolate shot at Rivendita, and wandering around the alleys with great company. Eventually, we were sitting down on the stairs of Piazza Trilussa drinking some wine and listening to some street musicians; it was definitely more exciting than a night in. 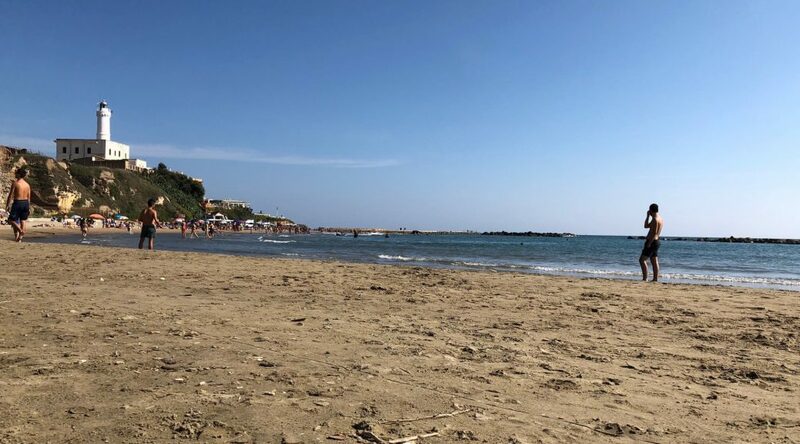 The next day, we took a trip out to Anzio – a little beach town to the south of Rome – to get some proper relaxation in. It’s not well pictured (mostly because I was not about to take my phone into the water), but the water at Anzio is so clear! There are caves and cliffs along the sides of the beach which made my adventurous spirit so happy! We swam, we explored, we tanned (and burned), but the clear skies kept me happy. Everything in Rome and around it forces you to slow down and I’m really starting to like it. 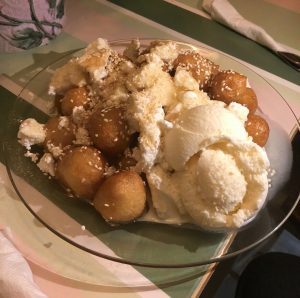 A beach “afternoon” really becomes a beach day, a “lunch” with coworkers becomes a long conversation over coffee, and a “trip across town” becomes a night of sightseeing and great food. Even now, as I’ve settled down, I’m already looking forward to my next clear day out in the city. After one long flight from Chicago to Rome, a week of jetlag, a weekend in the Italian region of Umbria, and a brief period of lost luggage, I can finally (hopefully) say that I have settled into Roma at the John Felice Rome Center (JFRC). It’s been a whirlwind of a week filled with gelato, glasses (or maybe bottles) of red wine, and practicing Italian, but I am so excited to be in Rome for this next semester during my year abroad. I can vividly remember the study abroad information session during Loyola Weekend in my senior year of high school when I first heard about the Ricci Scholars Program. The Ricci Program allows me to do cross-cultural research between Rome, Italy, and Beijing, China. From the first moment I heard about it, I knew I wanted to participate but it feels slightly surreal now that I am actually in Rome preparing to research changes in labor law and labor organization over the past half-century. Not going to lie, the amount of work I’m staring down for this semester and the upcoming year has me feeling a little bit stressed. How am I supposed to balance my work while trying to soak up this whole experience? Last week, every night felt like a choice between being abroad and studying abroad. 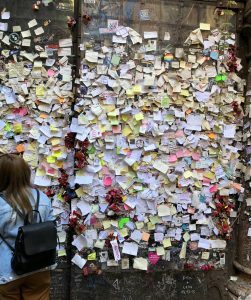 I was either back at the JFRC reading and working or I was out in Rome – a beautiful city – exploring all of its nooks and crannies. Every turn around the corner was a whole new adventure… but it also felt like I was shaking off my work. 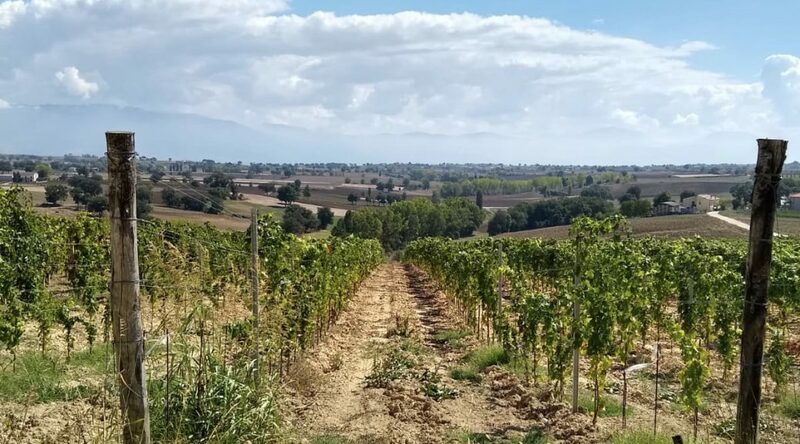 This past weekend in Umbria, however, really helped me to realign myself and my goals for this semester. At first, I was upset that I would lose a whole weekend of either exploring or studying. 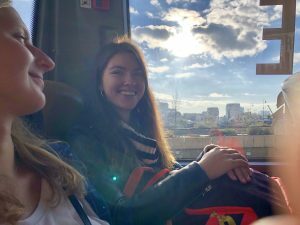 Yet, as we traveled from city to city in Umbria, as we saw all these hidden gems of Italy, it forced me to slow down and realize that all of last week – in trying to immerse myself fully into my semester abroad – I was completely failing at immersing myself fully into my semester abroad. That fast-paced desire to experience everything, to do everything is so utterly American. This semester is about learning from Italian history and culture, and that means not just walking through a piazza but stopping in it, not just looking at a statue but reading up on it, and not just doing some research but actually learning from it. And why shouldn’t I stop and stare for a while? Every part of this country is beautiful. And I know that no amount of speaking Italian, eating gelato, or learning about Italy this semester in Rome will be able to make me Italian, but maybe – if I let it – it can make me a little less American.